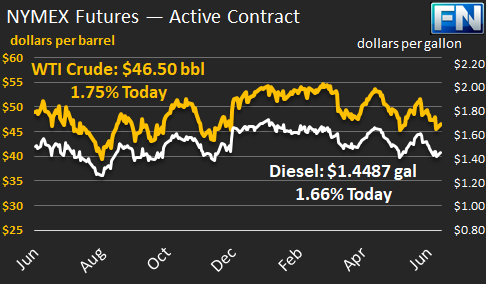 WTI crude prices have strengthened to $46.50/b this morning. WTI prices were flattish on Friday, but ended the day up by $0.12/b. The week ended $1.88/b in the red. WTI opened at $45.80/b today, an increase of $0.09, or 0.20%, above Friday’s opening price. Current prices are $46.50/b, up by $0.67 from Friday’s closing price. Diesel opened at $1.4312/gallon this morning. This was an increase of 0.68 cents (0.61%) above Friday’s opening price. Current prices are $1.4487/gallon, up by 1.75 cents from Friday’s closing price. Gasoline opened at $1.5017/gallon today, an increase of 0.98 cents, or 0.66%, from Friday’s opening. Prices are $1.5175/gallon currently, up by 1.58 cents from Friday’s close. 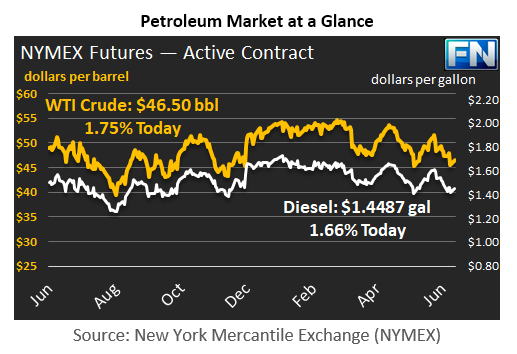 Oil prices were stable with a slight upward trend on Friday, and this morning brought a surge of buying that brought prices up by approximately $0.50/b. The oil sell-off on Wednesday and Thursday has reversed somewhat. Friday brought a significant sell-off in tech stocks, which in some cases made oil futures look like a better investment. Oil supplies remain more than ample, however. Baker Hughes reported on Friday that the active oil and gas rig count rose by 11 during the week ended June 7th. The rig count totals 927, the largest rig count since April of 2015. Geopolitical tension continues in the Middle East. Qatar remains isolated, surrounded by now-hostile neighbors. The land border to Saudi Arabia is closed, and Qatar’s national airline have been banned from the air space of its Gulf State neighbors. Qatar’s Finance Minister has stated that the Qatari economy is well-diversified, however, and that actions by its neighbors will not cause it to change its foreign policy. Qatar is heavily reliant on food imports. Local news sources report of consumers panic-buying food at supermarkets during this Ramadan month. Iran also reportedly is sending food to Qatar.